(CBS News) Boots & Barkley is recalling its American Beef Bully Sticks that were sold at Target stores nationwide from April through September, over potential salmonella contamination. The voluntary recall was issued by Denver-based Kasel Associated Industries, the sticks' manufacturer, and applies to all six-count 5-inch packages of Boots & Barkley "American Beef Bully Sticks." The U.S. Food and Drug Administration is urging pet-owners to look for signs of salmonella in animals that ate the sticks, because the infection can be risky to both pets and humans. Salmonella bacteria can sicken animals that eat these products and humans are at risk for salmonella poisoning from touching contaminated pet products, especially if they have not thoroughly washed their hands after handling. People who may have been infected with salmonella could experience nausea, vomiting, diarrhea, abdominal cramping and fever. In rare cases, the bacteria can lead to severe symptoms like arterial infections, endocarditis, arthritis, muscle pain and urinary tract symptoms. Pets with salmonella may appear lethargic and have diarrhea (sometimes bloody), fever and vomiting. Other pets will show a decreased appetite, fever and abdnominal pain. What's more, infected pets who appear otherwise healthy can carry salmonella and spread it to other animals or humans. "If your pet has consumed the recalled product and has any of these signs, please contact your veterinarian," the FDA said in a press release. Kasel is recalling all lot numbers of the sticks after tests by Colorado's Department of Agriculture found salmonella in the following four lots: BESTBY20APR2014DEN, BESTBY01JUN2014DEN, BESTBY23JUN2014DEN, and BESTBY23SEP2014DEN. No illnesses have been reported to date in animals or humans in connection with this recall. This past May, a salmonella outbreak tied to some products from Diamond Pet Foods sickened 14 people across nine states. 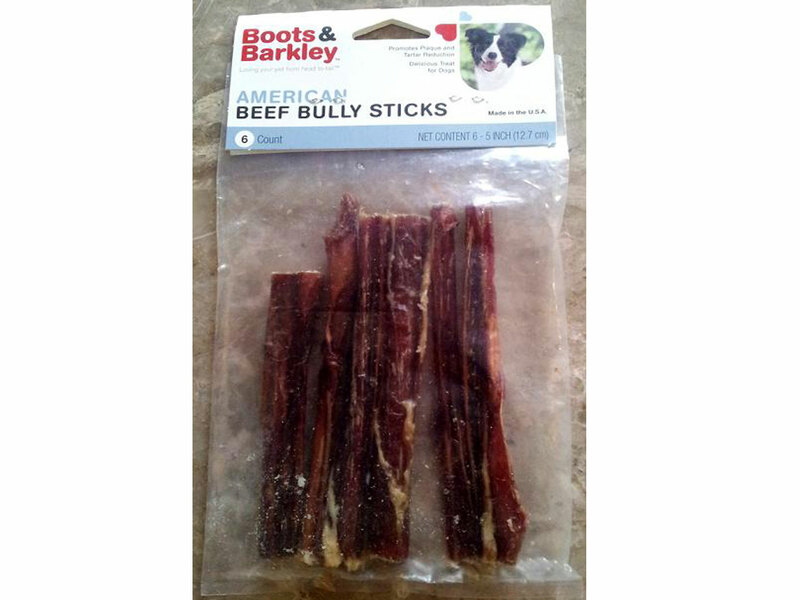 Consumers who have purchased the six-count 5-inch packages of Boots & Barkley American Beef Bully Sticks are urged to return it to the place of purchase for a full refund. Consumers with questions may contact Kasel Associated Industries at 1-800-218-4417.